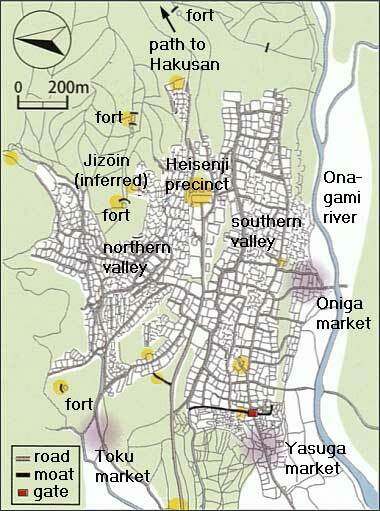 Former Temple Precinct of Hakusan Heisenji: A vast Medieval religious urban center built with stone. 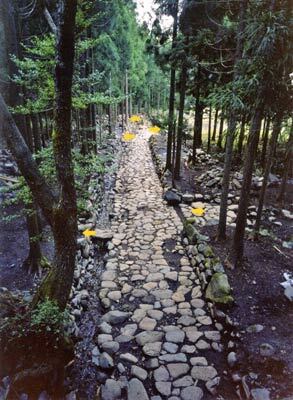 Stone-paved roads and stone fences of the Warring States period emerged. An excavated Medieval stone-paved road A Medieval stone-paved road excavated in a mountain area of the 3,600 residential remains of the southern valley. Approximately 230 m were excavated of the road, 2.1 ∼ 3 m in width and packed with river cobbles as paving. Entrances to the residences seen on both sides (arrows) are found at evenly spaced intervals. At present, it is the largest excavated Medieval stone-paved road nationwide. From behind Heisenji a trail roughly 30 km in length stretches up to the summit of Hakusan. Along this are scattered numerous remains of sites for ascetic training and lodging. The former layout of Heizenji had the main cloister located at the center, with clusters of residences on the two adjacent valleys. From excavations the remains of a number of these residences have been confirmed. Also, the character ichi ( "market") is seen in various place names around the perimeter of the precinct, revealing its conditions as a grand religious urban center. The path extending in a straight line between the residence remains and the cypress grove on the right is a stone-paved road. Features extend in the cypress grove as well, and access from the stone road to residences on both sides can be seen. The photo above of this road was taken from a point towards the back of this picture. This illustration is a reconstruction based on the features excavated at the site attributed to Jizōin of the northern valley residence cluster. In the Medieval period, it is said that 6,000 residences like this existed. Surviving height: 13 cm (reconstructed as 20 cm); width: 10 cm. Produced at the Jingdezhen kiln in Yuan Dynasty China. Thought to be portrayed as sitting on a boulder draped in cloth, with the hands resting on the knees in a mudra of meditation. Accessories depicted as jewels and flowers adorn the body, and the sleeve of the garment drapes down to the seat. 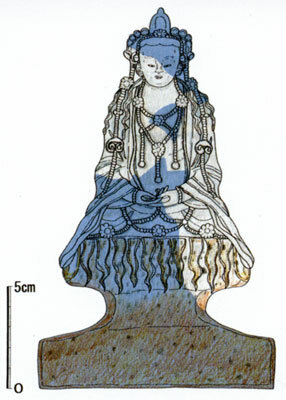 As examples of Yuan period light blue porcelain Bodhisattvas are virtually unknown in Japan, this is an important item for considering the trade, circulation of goods, and culture of the time. In the reconstructed drawing, the white portions are those actually recovered. Warring States period, fifteenth ∼ sixteenth centuries. 1. Portable stone brazier (height: 23.8 cm; diameter: 39.5 cm). 2. Tea mortar. 3. Seto-Mino ware tenmoku-glazed tea bowl. 4. Seto-Mino ware tea caddy. 5. Inkstone. 6. Huanan sancai brush rest. 7. Stone basin. 8. Copper rokki bowl. As Buddhist paraphernalia utilized by the priests, copper dishes (rokki) for placing on a Buddhist altar and prayer beads were recovered. As utensils favored by the priests, there were stationary goods (inkstones, ink, brushes, brush rests) and tea ceremony utensils (tea mortars, tea urns, tea caddies, tenmoku-glazed tea bowls, braziers), basins for flower arranging and Chinese high quality ceramics for decorating a sitting room. In addition, fragments of armor and projectile points were recovered, probably used by warrior monks. 1. Echizen ware jar (height: 46.9 cm; diameter: 38.1 cm). 2. Echizen ware mortar bowl. 3. Seto-Mino ware grating dish. 4. Ladle. 5. Knife. 6. Cutting board. 7. Celadon dish. 8. Seto-Mino ware bowl. 9. Celadon bowl. 10. Qinghua ware bowl 11. Celadon dish. 12. Porcelain dish. 13. Celadon lobed dish 14. Qinghua ware dish 15. Seto-Mino ware dish. 16. Porcelain small bowl. 17. Chopsticks and chopstick rest. 18. Stone foot warmer. 19. Unglazed earthenware sake cups. The bulk of the items recovered from the remains of residences are articles of daily life. 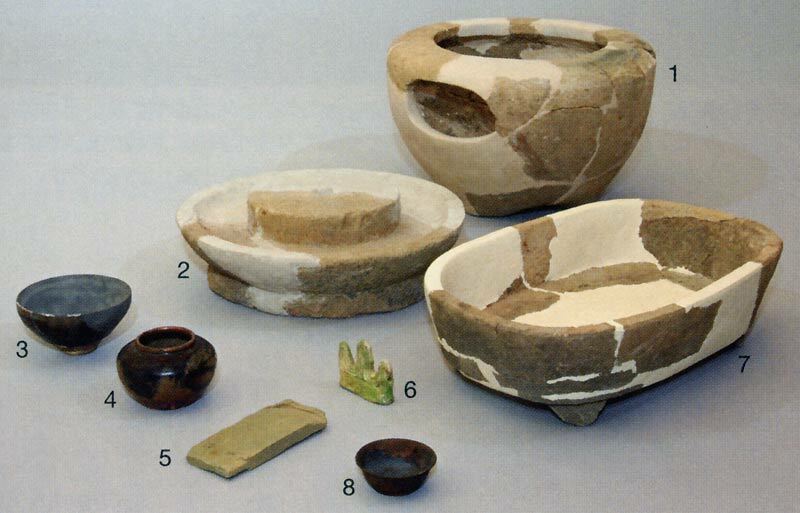 Echizen ware, from the ancient province of Echizen where Heizenji was located, was used for storage jars and cooking utensils such as mortar bowls, and cooking was evidently done with the aid of cutting boards, knives, and wooden ladles. For tableware, stoneware of Chinese manufacture was utilized more than domestic Seto-Mino ware. Also, in order to overcome the severe winters, stone foot warmers and ceramic charcoal braziers were used. The former temple precinct of Hakusan Heisenji is a medieval mountain temple, located at the entrance on the Echizen (Fukui prefecture) side to a path for ascent and worship of the sacred mountain Hakusan, and is generally known by the name of Heisenji. Today the entire area of the former precinct of Heisenji, roughly 200 ha, is designated a Historic Site (designated in 1935, and extended to all of the former precinct in 1997), and excavation and preparation as a Historic Site are being conducted by the Katsuyama municipal Board of Education. 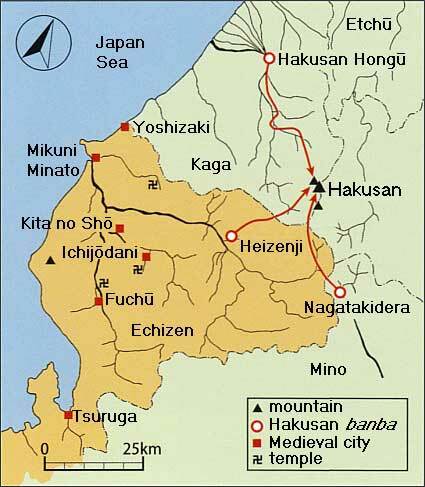 According to Hakusan no ki which has been passed down in Ishikawa prefecture, the three ancient provinces of Echizen, Kaga (Ishikawa) and Mino (Gifu) all had starting points for paths, leading up to the mountain peak, that were points of departure for ascetic training (banba); these bases for the Hakusan cult were called the "three banba," indicating Heisenji of Echizen, Hakusan Hongū of Kaga (in the city of Hakusan), and Nagatakidera of Gifu (in Gujō). Among these Heisenji is closely linked with the Echizen priest Taichō who founded the cult in the eighth century, and is recognized as the core temple of the Hakusan cult. At the peak of its prosperity, from the Muromachi to the Warring States periods, it is related that Heisenji could boast a strength rivaling the major warlords, consisting of: 48 shrines and 36 temples standing within its precinct, along with an urban complex of sanctuaries, pagodas, and living quarters for priests or shrine personnel; a domain yielding revenues of 90,000 koku of rice (1 koku = approx. 180 l, or 5.1 bushels), or 90,000 kan of copper coin (1 kan = 1,000 coins called mon); 8,000 warrior monks. But in 1574, the Echizen uprising of followers of the Honganji sect of Jōdo Shinshū Buddhism occurred, and Heisenji was attacked and burned as an enemy force, being completely destroyed in the conflagration. After rebuilding, the precinct was reduced to one tenth of its former scale, and with the Meiji program of separation of Shinto and Buddhism the temple name of Heisenji was abolished, and became Hakusan Jinja (shrine). 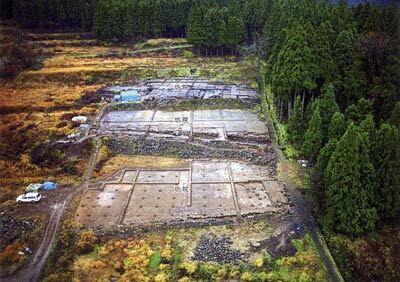 In the investigations to ascertain the extent of the site, conducted from 1989 by the Katsuyama municipal Board of Education, beneath the forest and paddy several hundred meters distant from the precinct of Hakusan shrine, stone-paved roads and stone fences of the Medieval period were excavated in well preserved condition. These features are thought to belong to the Warring States period, from the second half of the fifteenth to the second have of the sixteenth centuries. As the investigation proceeded, the Medieval landscape of Heisenji as a large urban religious center came floating into view. 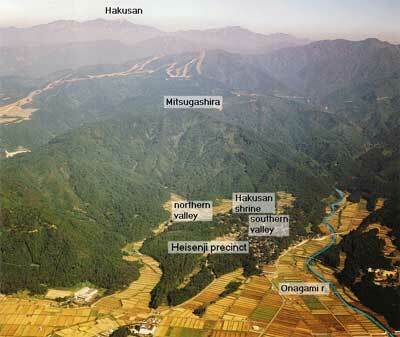 The former Heisenji precinct, located on a ridge extending westward from the 777.5 m elevation mountain Mitsugashira, and was ascertained to have spread over a wide area 1.2 km east-west by 1 km north-south, ranging from 240 to 400 m in elevation. The present day Hakusan shrine precinct is the area where the central cloister of Heisenji had been, which is understood to have been a syncretic mixture of Shinto and Buddhism, with Shinto style buildings, such as an inner shrine (honden) and worshipper's hall (haiden) 33 spans long, standing alongside Buddhist style buildings, such as a large pagoda and lecture hall. Large clusters of residential complexes collectively known as the Rokusenbō (6,000 residences) stood on both sides of the central cloister, located on northern and southern valleys. At the 3,600 residences of the southern valley in particular, stone-paved roads laid out horizontally and vertically on a grid, a planned arrangement of numerous residences, and stone fences lined up in the manner of stairs have been excavated. 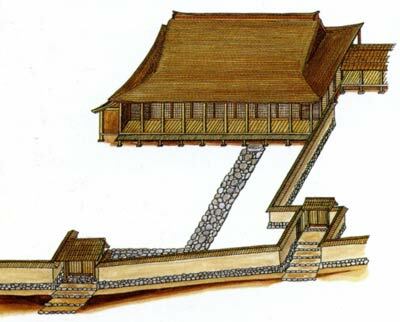 Each residence was made by leveling the gradual slope, with a scale averaging about 1,000 sq m. The grounds were enclosed by earthen walls, within which stood several buildings. 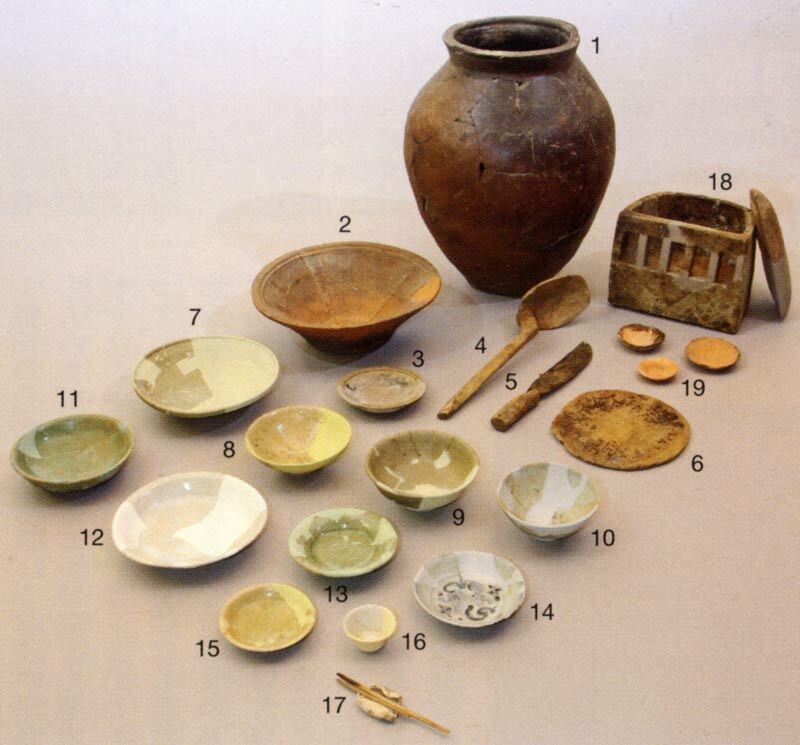 From these residences articles of daily living, such as Chinese and domestic glazed stoneware, writing implements and Buddhist paraphernalia, have been excavated in large quantities, showing the style of living of Heizenji priests at the height of its prosperity. Also, as the oldest material from the former precinct, Sue ware of the first part of the ninth century was recovered. 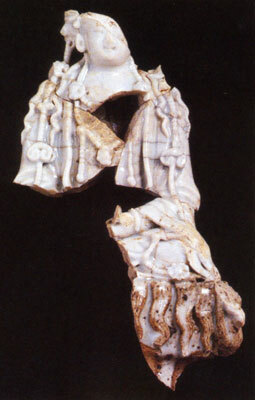 Artifacts from that time on have been ascertained for the 1,000 year span to the Edo period, but quite understandably those of the fifteenth to sixteenth centuries are most numerous, totaling several hundred thousands of items including fragments.